Prominent & Leading Manufacturer from Mumbai, we offer large shredder. Large shredder from SASCO is a big machine capable of destroying big objects with considerable ease, driven by a very powerful motor and gearbox it has enormous strength to break even the toughest materials into bits. 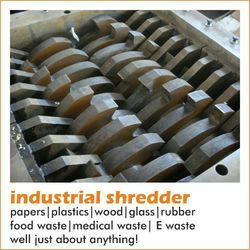 These large shredder are used for commercial purposes in the industrial sector where a lot of waste needs to be destroyed and sensibily disposed.